Tickets will be on sale at the September Main meeting from about 9.am. The Raffle will be on sale at all meetings throughout out September, November and December and will close at 12 noon on 3rd December. Prizes drawn at 3:00pm that day (see ticket details below). VCGR Permit No: 47862. 3000 tickets authorized. 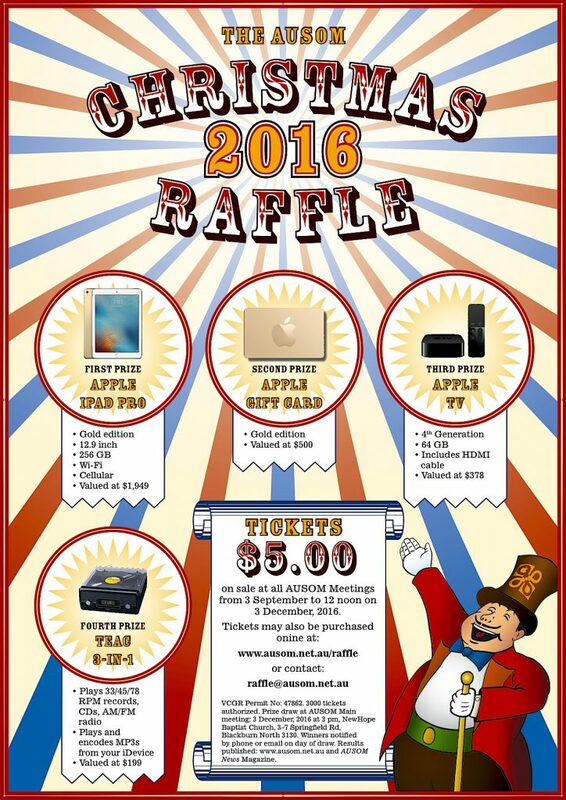 Prize draw is at AUSOM Main meeting – 3 December 2016 at 3pm. NewHope Baptist Church 3 – 7 Springfield Rd, Blackburn North 3130. Winners notified by phone or email on day of draw. Results published: www.ausom.net.au and AUSOM News Magazine February 2017.